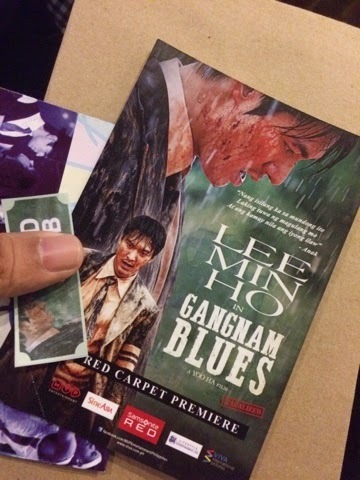 Watched the premier of Gangnam Blues this evening and I'm literally writing this right after we went out of the theater. It's premier was shown in a special theater called Sine Asia that will only be seen in select SM Cinemas. They tagalized the whole film and it was quite long at approximately 2 and a 1/2 hours long of how the Gangnam district came about. Although characters and situations were fictitious, I think there's a huge connection between this film and how Gangnam is being perceived by the South Koreans today. Anyway, Lee Min Ho was absolutely brilliant. His co star too. I won't suggest this be seen by teens and think this should have had at least an R rating. There are body parts seen, like you know. Anyway, this Sine Asia project of SM and Viva International would really be a good venue to see more Asian films from Thailand, Japan, Korea, Hong Kong and Taiwan. This premiere was a huge success and of course, I think the fans loved it a lot. It's PG 16 right now and if your parents come with you, you should watch it. Do not watch this without adult supervision. The other films lined up though especially the one by Chow Yun Fat was really funny, I'd watch that too. As for watching Gangnam Blues, it's totally worth it. A bit tragic though. I don't wanna spoil anything so I'm a little careful now.